Kunst på Øya proudly presents GOLD GUIDES ME by Anne Katrine Senstad. The text based light sculpture serves as a welcoming statement above the festival entrance area. 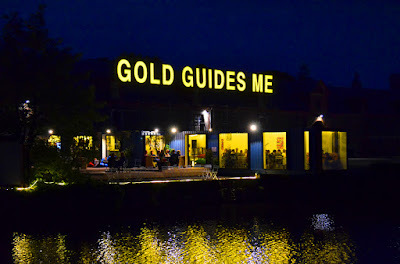 The monumental site specific light and text based sculptural work was initially installed on the roof of the UNESCO protected Gistfabriek as part of the inaugural Bruges Contemporary Art and Architecture Triennale in 2015. 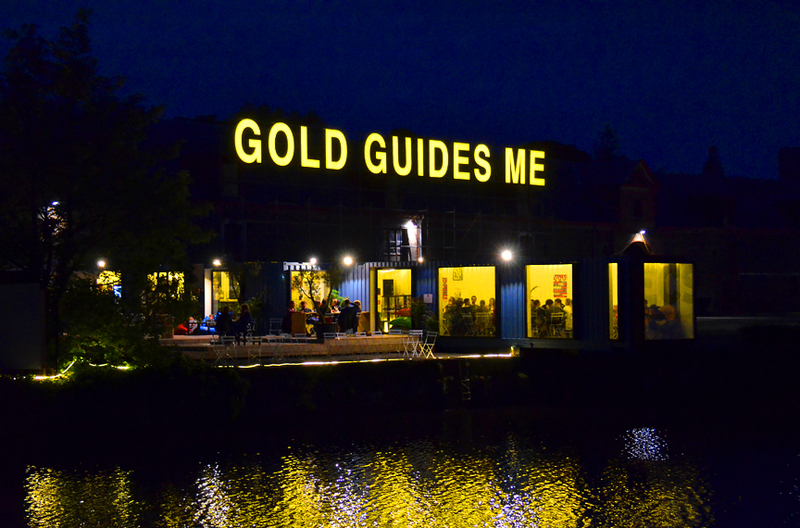 Gold Guides Me is inspired by the roman philosopher and statesman Boethius’s literary work The Consolation of Philosophy, while simultaneously a word play on God Guides Me, and commercial advertising aesthetics. The statement leads us to contemplate financial and political economics, greed, ethics and western values systems. What happens when we exchange GOD with GOLD? When our inner compass is no longer guided by collective or spiritual values, but the desire for individual wealth, power and ownership? GOLD GUIDES ME is part of a larger project by Senstad entitled “Capitalism in the Public Realm”, that examines ethics and the public space. The artwork was produced for the Bruges Contemporary Art and Architecture Triennale in collaboration with Brugge Plus. Norwegian artist Anne Katrine Senstad is based in New York and educated at Parsons School of Design and The New School for Social Research, NY. Senstad’s practice is anchored in interdisciplinary practices with a focus on site specificity and social-political concerns while simultaneously engaged in the disciplines of perception, light, color and sound. Notable exhibitions include "Topologies for aVertical Sound - Anne Senstad, a midcareer survey", Venice Biennale 2017, "TIME BEYOND PLACE", a cross cultural platform Senstad established for and with fellow Saudi Arabia female artists in collaboration with King Abdulaziz Center for World Culture, Cultrunners and ITHRA, "Kinesthesia in Kvinesdal" at UtsiktenKunstsenter, Kvinesdal, "Is Her Name Red?" at Stiftelsen 3.14, Bergen and "Light Words" at Zendai MOMA, Shanghai. Public Art commissions include the lobby art for The Wolfe Center for the Arts at BGSU, USA, designed by Snøhetta Architects.